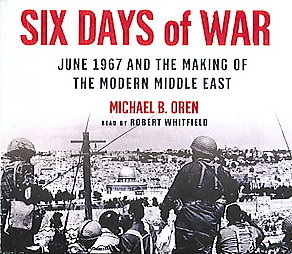 -Israeli idea of "land for peace"
View Six-Day War and over 3,000,000 other topics on Qwiki. Gamal Nasser expels the UN Peacekeeping forces in 1967, so Egyptians close the straits to the Israelis and move troops to the border but Israelis have high intelligence and follow through with their first strike policy. So they launched bombing attack that destroys Egyptian airforce while it's grounded during the first 12 hours and the Israelis gain the Sinai peninsula, the Golan Heights and West Bank. 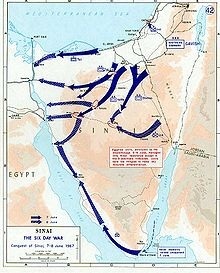 They continued to Cairo, but Americans makes them stop in fear of angering other Arab nations so the entire war only 6 days because of their Israeli idea of "land for peace."